※Givón, Talmy (1979) On Understanding Grammar. Academic Press. 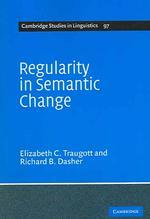 This new and important study of semantic change examines how new meanings arise through language use, especially the various ways in which speakers and writers experiment with uses of words and constructions in the flow of strategic interaction with addressees. In the last few decades there has been growing interest in exploring systemicities in semantic change from a number of perspectives including theories of metaphor, pragmatic inferencing, and grammaticalization. Like earlier studies, these have for the most part been based on data taken out of context. This book is the first detailed examination of semantic change from the perspective of historical pragmatics and discourse analysis. Drawing on extensive corpus data from over a thousand years of English and Japanese textual history, Traugott and Dasher show that most changes in meaning originate in and are motivated by the associative flow of speech and conceptual metonymy. I What is Linguistic Morphology? by The Ohio State University, Department of Linguistics eds. 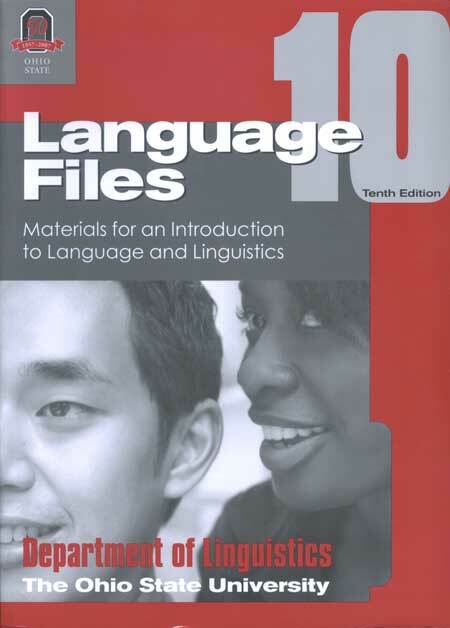 Since its inception thirty years ago, the Language Files has grown from a collection of materials designed simply as a supplement for undergraduate courses into a full-fledged introductory textbook. The scope of the text makes it suitable for use in a wide range of courses, while its unique organization into instructor-friendly files allows for tremendous flexibility in course design. The Language Files was originally the idea of Arnold Zwicky, who was among its first authors. Since the first edition, many editors have contributed to the development of the Language Files; the current edition is the result of this cumulative effort. This edition has been significantly expanded and includes more than 25% new material. Each chapter has been restructured to begin with a brief overview of the topic, including a comic that provides insight into the linguistic subfield covered in the chapter. Each chapter now also ends with a separate file containing practice exercises, discussion questions, and activities relevant to the chapter. Some chapters also contain recommended further readings following the exercises. The discussion of signed languages has been expanded and incorporated throughout the text, such that examples of various linguistic phenomena (e.g., phonetic descriptions, phonological patterns, morphological structure, language variation and change, etc.) in signed languages are presented as they become relevant. Several chapters have been updated in terms of their content, to incorporate more recent investigations and findings in linguistic research. These include the chapter on language variation, which now focuses solely on variability at different levels of linguistic structure and the causes of such variability (both regional and social), and a new chapter on language and culture, which includes other issues of sociolinguistic interest such as language and identity or language and power. A new chapter has been added to help answer the common question of what one can do with a degree in linguistics. This chapter provides overviews of six practical ways that a linguistics education can be applied: language education, speech-language pathology and audiology, law, advertising, code-breaking, and the further study of linguistics. File 9.0 How Do We Store and Process Language? File 11.0 What Is Language Contact? File 12.0 What Is Language Change? File 13.0 What Is the Study of “Language and Culture”? File 15.0 What Is Computational Linguistics? File 16.0 What Can You Do With Linguistics? Baynham, M., Deignan, A. and White, G. (eds) (2004). "Applied Linguistics at the Interface". London: Equinox Publishing Ltd.
Deignan, A. (1995). "Collins Cobuild Guides to English 7: Metaphor". London: HarperCollins. Metaphor is a topical issue across a number of disciplines, wherever researchers are concerned with how speakers and writers package and process messages. This book is addressed at readers from diverse academic backgrounds who are interested in ways of researching metaphor from different perspectives, and especially through corpus linguistics. A number of approaches to and exploitations of metaphor, including conceptual metaphor theory and cognitive approaches more generally, text and spoken discourse analysis, and CDA, are discussed, explored and critiqued using corpus data. The book also includes corpus linguistic studies of different aspects of metaphor, which investigate its linguistic and semantic properties and relate them to current theoretical views. The book demonstrates the need for naturally-occurring language data to be used in the development of metaphor theory, and shows the value of corpus data and techniques in this work. Cognitive English Grammar is designed to be used as a textbook in courses of English and general linguistics. It introduces the reader to cognitive linguistic theory and shows that Cognitive Grammar helps us to gain a better understanding of the grammar of English. The notions of motivation and meaningfulness are central to the approach adopted in the book. 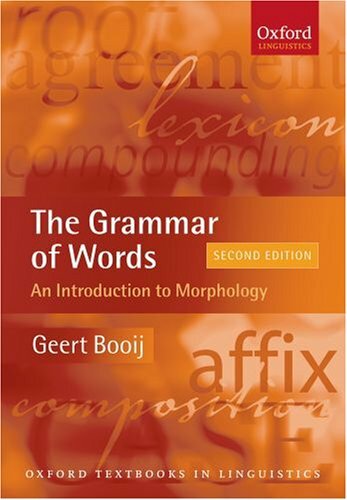 In four major parts comprising 12 chapters, Cognitive English Grammar integrates recent cognitive approaches into one coherent model, allowing the analysis of the most central constructions of English. Part I presents the cognitive framework: conceptual and linguistic categories, their combination in situations, the cognitive operations applied to them, and the organisation of conceptual structures into linguistic constructions. Part II deals with the category of ‘things’ and their linguistic structuring as nouns and noun phrases. It shows how things are grounded in reality by means of reference, quantified by set and scalar quantifiers, and qualified by modifiers. Part III describes situations as temporal units of various layers: internally, as types of situations; and externally, as located relative to the time of speech and grounded in reality or potentiality. Part IV looks at situations as relational units and their structuring as sentences. Its two chapters are devoted to event schemas and space and metaphorical extensions of space. Cognitive English Grammar offers a wealth of linguistic data and explanations. The didactic quality is guaranteed by the frequent use of definitions and examples, a glossary of the terms used, overviews and chapter summaries, suggestions for further reading, and study questions (with solutions, available online at: www.benjamins.com/). This is a provisional table of contents, and subject to changes. Antonio Barcelona, University of Murcia. IN 1966 Allen and Beatrice Gardner, two psychologists at the University of Nevada in Reno, had a bright idea. They were interested in the evolution of language and, in particular, in the linguistic capabilities of great apes. Previous attempts to teach chimpanzees to talk had ended in failure and the matter was considered by most people to be closed. But the Gardners realised that speech and language are not the same thing. Many deaf people, for example, are unable to speak but are perfectly able to communicate by gestures that have all the attributes and sophistication of spoken language. Given the very different anatomies of the human and chimpanzee larynx, the Gardners suspected that previous experiments had failed because chimps are physically incapable of speech. The new edition of An Introduction to Japanese Linguistics gives an updated, comprehensive account of Japanese linguistics, covering phonetics, phonology, morphology, syntax, semantics, language change, dialect variation, and gender differences. Includes exercises exploring descriptive and theoretical issues and reading lists which introduce students to the research literature. Natsuko Tsujimura is Professor of Japanese Linguistics at Indiana University. Her publications include The Handbook of Japanese Linguistics (Blackwell, 1999), and she has published extensively on various aspects of lexical semantics. 2. Sequential Voicing - "Rendaku"
1. Accent: Shosuke Haraguchi (University of Tsukuba). 2. 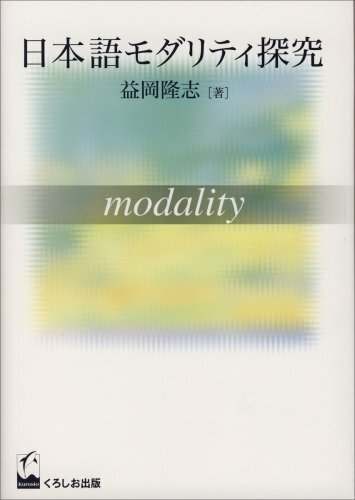 Mora and Syllable: Haruo Kubozono (Kobe University). 3. The Phonological Lexicon: Junko Itô and Armin Mester (both University of California at Santa Cruz). 4. 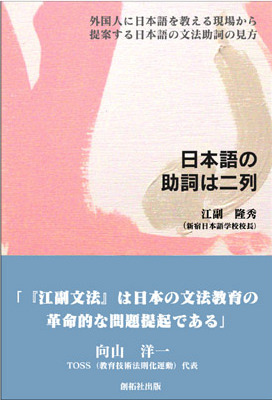 Variationist Sociolinguistics: Junko Hibiya (Keio University). 5. Scrambling: Naoko Nemoto (Mt Holyoke College). 6. Reflexives: Takako Aikawa (Microsoft). 7. Passives: Hiroto Hoshi (School of Oriental and African Studies). 8. Causatives: Shigeru Miyagawa (MIT). 9. Quantification and wh-Constructions: Taisuke Nishigauchi (Kobe Shoin Women's University). 10. Word Formation: Taro Kageyama (Kwansei Gakuin University). 11. Tense and Aspect: Toshiyuki Ogihara (University of Washington). 12. Lexical Semantics: Natsuko Tsujimura (Indiana University). 13. First Language Acquisition: Yukio Otsu (Keio University). 14. Sentence Processing: Mineharu Nakayama (Ohio State University). 15. Discourse Analysis and Pragmatics: Senko Maynard (Rutgers University). 16. Sociolinguistics: Honorifics and Gender Differences: Sachiko Ide and Megumi Yoshida (Japan Women's University).